AB3DBasic is not just a 3D design software, it's also a learning tool for those who don't quite understand three dimensionality. By sketching on the three faces of a cube, or using the front/side/top view modeling, users can learn how 3D objects are created out of 2D shapes. Use the drawing tools to create a 2D sketch. Toggle the cubeview button on/off to compare your model to your 2D sketches. Use the dimension controls feature to change the size of the model in 3 directions. Draw on one or more faces of the cube, or use the auto modes feature. Press the 3D button to see your sketches transform to a 3D model! 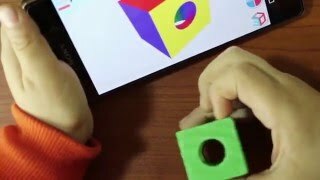 Cubeview is one way of easing the 3D learning process. Draw sketches on the face of a cube and watch them transform into a 3D model with the click of a button.